HvG celebrates and the ORF joins the party! To mark Hubert's upcoming 65th birthday on 17th November, the 2012 documentary Hubert von Goisern – 60 Jahre und kein bisschen leise (60 years and still going strong) is back on TV – how the time flies! It's a foray through the diverse phases of Hubert's creativity and 20 years of alpine world music. Music with which he opens the ears and hearts of a cosmopolitan audience. Take a look at archive footage from the early days of the Alpinkatzen, through numerous journeys and adventures around the world, to the huge hit Brenna tuat's guat in front of a cheering crowd at the Donauinselfest. All is calm at the moment. Whenever he concludes a project, Hubert von Goisern vanishes into thin air, taking time out. His last undertaking, combining the blues of the American southern states with the alpine sounds of his homeland, bore abundant fruit in the form of studio and live albums, as well as an extensive tour. On 17th November the multifaceted musician turns 65. Hubert Achleitner, his civil name, joined the brass band in Bad Goisern as a trumpeter at the age of twelve. At the age of 19, by this time long-haired and intractable, he was thrown out. It wasn't until much later, in 1986 that he first picked up the accordion he hadn't touched for years. "I'd once drunk a whole bottle of schnapps and was so plastered that I decided to rip the thing apart, which of course didn't work, von Goisern says of the beginning of his great love. He learned to yodel on a motorway bridge in Regensburg, his most recent autodidactic addition to his instrumental talents: the alphorn. But: he as good as never practises, because "practising is stupid", he says. At the beginning of the 1970s he tried his hand in South Africa as a chemistry laboratory assistant and opponent of apartheid, later he was a music student in Canada, he married his girlfriend, taking her name and was called Hubert Sullivan. Back in Vienna, he met the musician Wolfgang Staribacher, founding the Alpinkatzen with him. Meanwhile his marriage came to and end. The first album Alpine Lawine (1988) flopped, the duo parted ways and "HvG" relocated to Salzburg, where he still lives today. 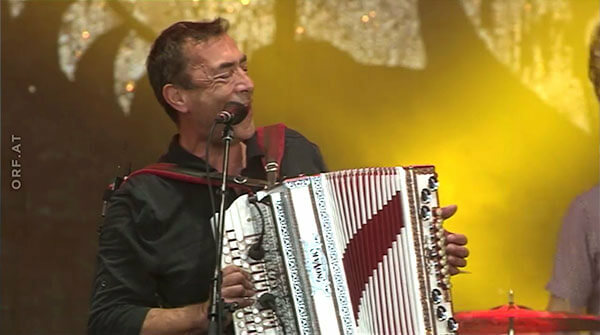 He took the band name with him, assembling the formation with new musicians, including Sabine "Alpine Sabine/Zabine" Kapfinger. With two albums, hits and concert highlights such as Koa Hiatamadl, Heast es net and Weit, weit weg as well as extensive tour, the Alpinkatzen hit the big time, but right at the high point of the still young band, von Goisern called a halt and changed profession. He composed the film music for Joseph Vilsmaier's Schlafes Bruder, he appeared at Martina Gedeck's side in front of the camera in Hölleisengretl. In 2014 he once more used one of his "breaks" for work on film and exhibition music. From 1996 von Goisern expanded his personal and artistic horizons with journeys to Tibet and to Jane Goodall in Tanzania - the ethno-musical reworking of both journeys are available on CD. After his return, albums once more appeared in familiar "Hubert style". From 2007 to 2010 faced his most daring adventure: he and his band played on a concert ship along the Danube to the Black Sea and up to the North Sea, which can be read about in the book Stromlinien, and heard as live music on Haut und Haar. In spring 2011 he played unreleased songs in numerous provincial taverns, the album EntwederUndOder was then released in the autumn, giving him his better late than never first number one in the Austrian charts with Brenna tuats guat. At the end of 2014 the freeman of Bad Goisern, six-time "Amadeus Music Award" winner and father of two adult children, repeated himself: once more he toured the country playing completely unknown compositions. In the months before he had explored the south of the USA and had returned with plenty of unpleasant experiences and copious blues. The work Federn didn't see the light of day until six months after the tour, almost at the same time at the film documentary tribute Brenna tuat's schon lang. On 23rd November he will be presented as patron of the Volksliedwerk campaign "Komm, sing mit" (Come, sing along). He, who describes himself as being extravagant with life, who is never really happy with the description of his music as "alpine rock" ("if you ask me: it's my music"), he, who refuses to allow his music to be used at political party events and publicly supports Federal President Alexander Van der Bellen, is currently enjoying a creative break. But he'll be back - his website entry from New Year's Day 2017 promises: "Head and heart are already full to the brim with my own dreams and plans awaiting realisation."